Holy Days — Holy Day: 8 a.m., 6 p.m.
Daily — Tue-Fri: 8 a.m. The Catholic Community in Jeffersontown, KY, opened in 1878 as a mission of St. Agnes parish with thirty families, the first parish in the southeastern part of rural Jefferson County. Fr. Louis C. Ohle began serving the mission in 1871, the first priest to come from the Preston Park Seminary (now Bellarmine University). Passionist priests from their monastery provided pastoral care from 1896 to 1902. On the feast of St. Edward in 1902, Fr. George Cone was appointed pastor of All Saints in Taylorsville and St. Edward. The next year Fr. Theodore Reverman (later the Bishop of Superior, WI) was appointed pastor until 1920. He founded the parish school in 1907 with the Ursuline sisters of Mt. St. Joseph (Owensboro), and some of his relatives are still parishioners. During the 1937 flood, Fr. Martin Frankenberger and the parish took in refugees from West Louisville and the downtown flood. They were housed and fed in the church, rectory, and school as a generous response to disasters for which the parishioners have always been resourceful and ministry-oriented. After World War II as suburban Louisville grew, the church, school, rectory, and convent were rebuilt from 1956-62 and nestled into the nearby neighborhood community. 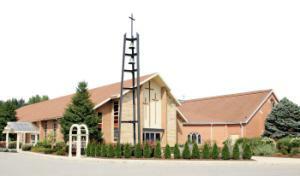 A parish hall/gym was built in 1979, and a new church sanctuary was built in 2000. There have been several school and parish improvements made right up to the current year. Ministry to the growing Latino community began in 2006. The parish school has over 300 students today and now includes a pre-school and pre-kindergarten under the school’s direction. An after-school program was started in 1999. The parish celebrated its 130th anniversary in 2014 with a new media center, classrooms, and expanded athletic field improvements as it responds to growing diversity and expanding parish ministries. St. Edward has been gifted with outstanding pastoral and lay leadership, families of multiple generations, vision, and sound financial management. Now a parish of over 3200 members, the friendly and welcoming parishioners are involved in more than one hundred ministries, both inside and outside of the Jeffersontown area.